How many people actually EAT seaweed? Is it just a coastal living thing? Many people eat fish, lobster, shrimp! But hardly ever the plants in the sea. Living in Atlanta I had only eaten it in 'faux' Sushi,but since moving to the ocean 5 1/2 years ago, I gave it a try in many other things and fell in love. Well, as much as you can fall in love with seaweed.... When we eat sea plants we are tapping into the ancestral and restorative source of all life-the ocean.Ounce for ounce, they are higher in vitamins and minerals than any other food.Sea greens are one of natures richest sources of vegetable protein,providing full spectrum of beta carotene, chlorophyll, enzymes,amino acids,fiber, and Octacosanol for tissue oxygenation. They are in fact the most nutritionally dense plants on the planet. Some of the things they can do for the body from the inside are cleanse and purify like they do our oceans, use their powerful antioxidants to promote anti-cancer activity, boost overall bone health, and help to balance your thyroid. They are also extremely beneficial to pregnant women. Sea green antioxidants can also increase your body's fat-burning ability. And If you are not EATING seaweed, you should at least be putting it on your skin! Aphrodite, the Goddess of Love who rose out of the sea, owed her supple skin, shiny hair , and sparkling eyes to the plants of the sea. Seaweed returns mineral salts to your skin that other environmental factors deplete. Skin cells retain moisture better from these essential minerals therefore increasing the elasticity and overall appearance. All the while adding amazing luster! A seaweed bath is the most effective way to get the wondrous benefits! 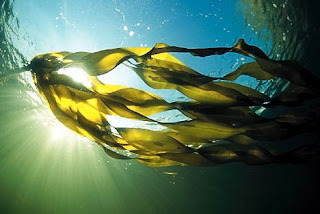 Seaweed balances your body chemistry instead of dehydrating it. The electrolytic magnetic action of the sea plants releases excess body fluids from congested cells and dissolves fatty wastes through the skin, replacing them with key minerals. If you live near an unpolluted ocean you can harvest the plants yourself, otherwise you can buy specialty seaweed soaks (coming soon to the DHW), or dehydrated forms at your local health food store. Immerse yourself in the transforming bath and let it work it's magick on you by coating and increasing perspiration to release toxins from your system, and replaces them by osmosis with minerals. 45 minutes is usually about right to balance the acid-alkaline system. Skin tone, color, and better circulation are almost immediately noticeable. Dry brush your skin before hand for best results. If you are under care for heart disease or high blood pressure , check with the Dr. to see if this is ok for you! Kelp-helps to remove radio active particles and heavy metals from the body. Also works as a blood purifier, relieves arthritis stiffness, and promotes adreneal, pituitary, and thyroid health. Kombu- Powerful skin healing nutrient germanium. Highest in natural mineral salts. Hijiki- high fiber with 20% protein also has the most calcium of any sea green. Arame- this is one of the ocean's richest sources of iodine. promotes soft, wrinkle-free skin, enhances hair's glossiness and helps to prevent hair loss when taken internally. Bladderwack- packed with vitamin K and is an adrenal stimulant. Wakame-widely used in the Orient for hair growth, luster , and skin tone. Dulse- 300 times more iodine and 50 times more iron than wheat. purifying and tonic effect on skin.